Of course, a big reason as to why it was this short is that I purposefully found multi-card scans I could exploit. Not that anyone would care. The overall goal is still the same from here on out, try to show off more than I take in, with the exception of trades and the National. I doubt I’ll be buying anything more from any card sites for a while, with or without credit, just so I can stay on track with that. I have so many more cards that have yet to be shown. 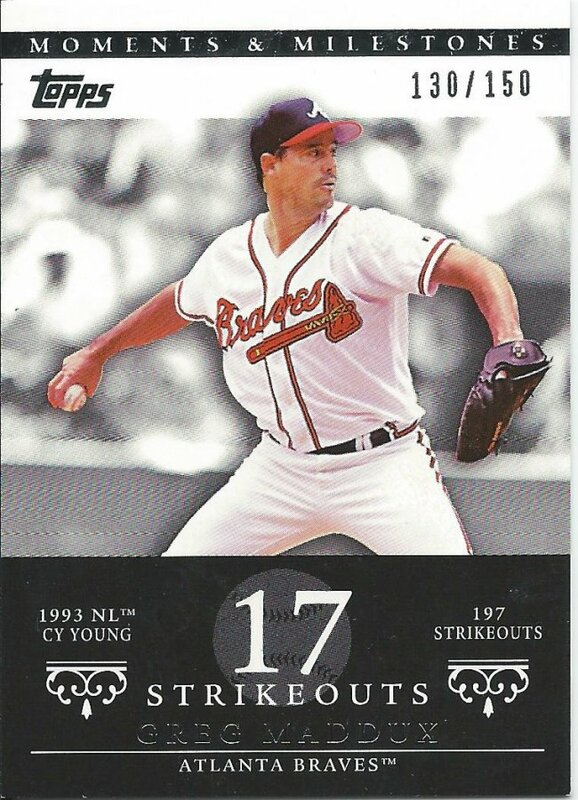 For instance, I have shown 978 different Greg Maddux cards on the blog, including what’s below. I have 1612 different ones, and a few more coming from that SL delivery. 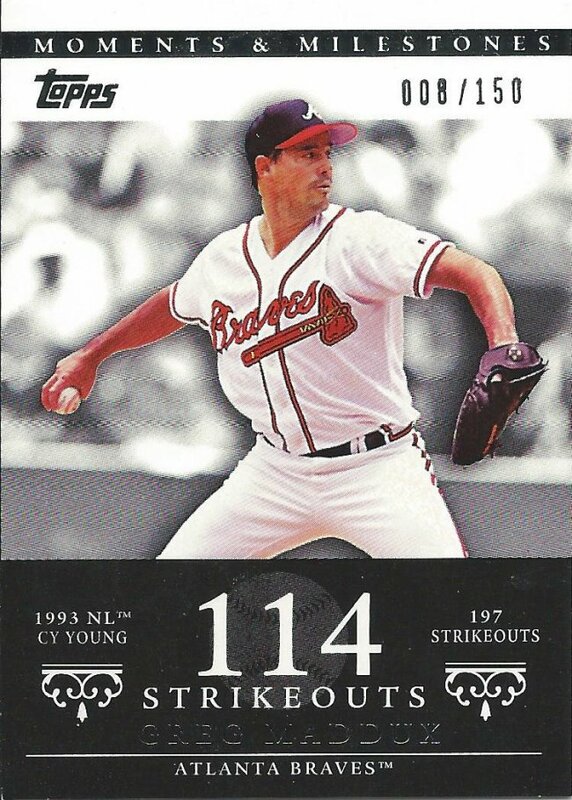 That’s 634 for Maddux cards alone that have yet to see the spotlight (currently split up between over 130 “master” scans). If I plan to show everything, I need to scale back my non-trade acquisitions. Those cards will be waiting for me. This whole thing is a marathon. Not unlike a certain marathon set we all know and only some of us love. Let’s celebrate this small moment with…you know. 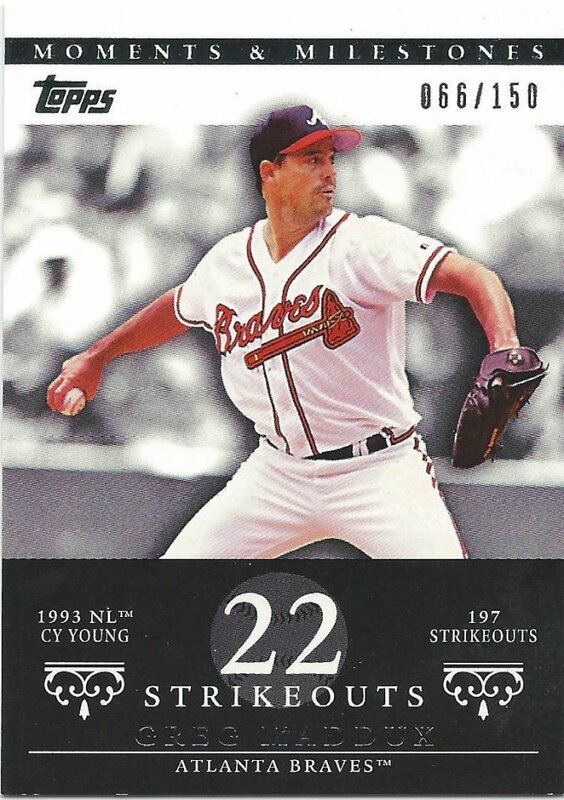 Maddux singled in a run earlier in the game to give the Braves the lead and he was still protecting that in the 6th inning when he struck out Chuck Carr for the second out. This third strikeout of the game showed that Maddux was settling down a little too late. The Braves were already down 4-0 when Ray Lankford went down looking with a runner on first. From the same game, his next K was Greg’s last. He was pulled after this fourth inning but still managed to get Bernard Gilkey swinging. His next start was also against the Cardinals, but it went a lot better. Maddux lasted 10 of 11 innings and struck out twice as many. This card is for the first of those eight, which came in the first inning, but after the Cardinals scored their first run. Mark Whiten couldn’t keep the singles train going and left two runners on. 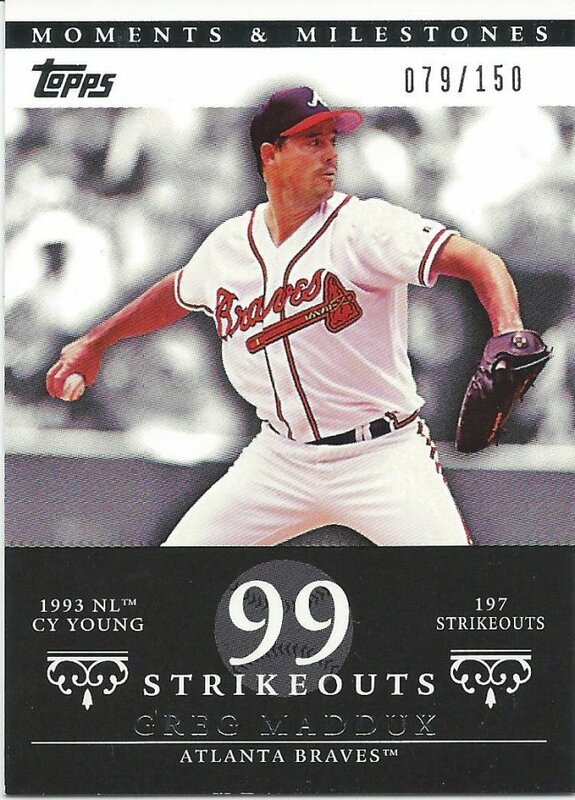 Skipping ahead a few months and this game gives Maddux his seventh win of the season. Only 4 Ks in the match, but the Braves were winning handily when Ruben Amaro swung and missed to start the bottom of the sixth. Back to the Cardinals. Can’t escape them in this run, and they handed Greg his 8th loss today. Maddux still managed 7 strikeouts and this second one happened against the second batter of the second inning, Brian Jordan. In the top of the 1st inning, Maddux had allowed three straight singles to open the ball game, but no one had scored yet. The bases weren’t loaded, however as lead-off man Tom Foley was out at third on one of those singles. That means there were runners on first and second for Orlando Merced, who whiffed on that third strike. The pirates would score later that inning. Surprisingly, we’re in the same game. This card is for the last of seven strikeouts, which happened in the top of the 7th inning. 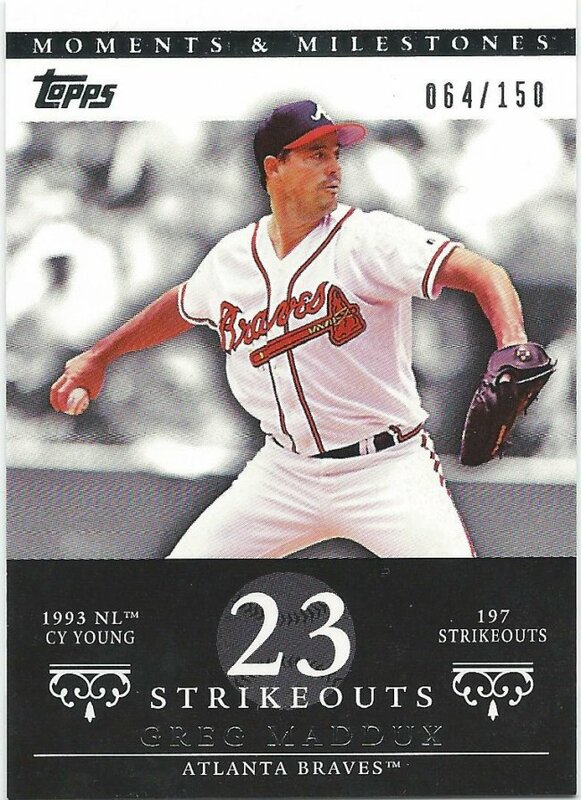 With the Braves leading 3-2 Jay Bell watched the pitch fly by him to end the inning, stranding a runner on second. The last strikeout on one of the last games of the season. The Braves needed this win (which they got easily off of the expansion Rockies) as they were in a heated battle at the top of the standings with the Giants, both tied at 103 wins after today. This last strikeout came in the sixth inning as Daryl Boston swung and missed to end the frame. 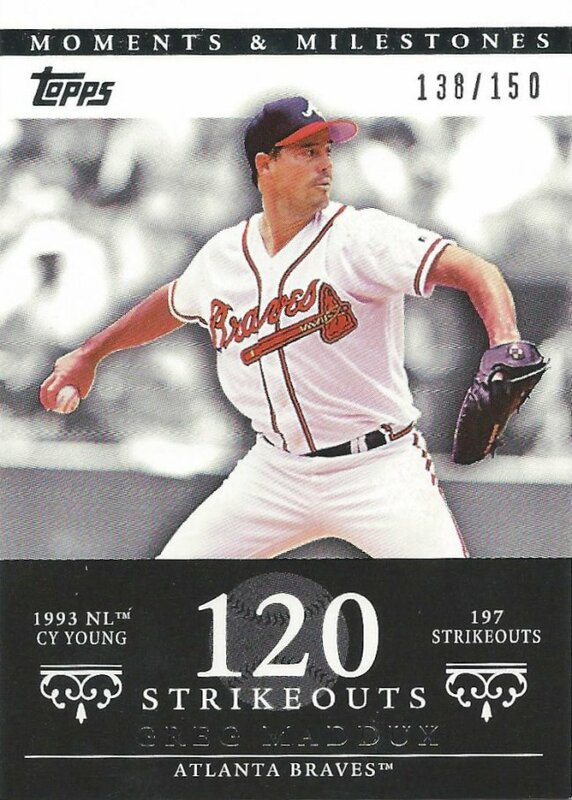 Not much you can do against a Cy Young winner (and eventual repeat winner). -2 left to show before taking Sportlots delivery.